Teachers have plenty of things on their plate. From planning lessons and grading assignments to parent-teacher meetings, the list goes on. But what if you also found yourself tasked with getting classroom resources for the students? What if the only way to get to school was by walking or on the back of a disgruntled donkey? Most of all, what if your students didn’t enjoy learning? All these were challenges Hicham faced as a teacher of a small primary school in Al Hoceima, Morocco. This story is a homage to his mission of uplifting the lives of his students through an ingenious approach to everyday education. Hicham Elfaquih was born in 1985 in the picturesque city of Al Hoceima, the capital of the northern Rif region of Morocco. From a young age he was interested in educational and cultural activities for children, and aspired to be a teacher. After completing his baccalaureate degree from Abdelmalek Essaadi University, he continued his Master in Criminal Law: Childhood and Juvenile Justice at FSJEST, Tanger. Then, Hicham returned to Al Hoceima where he started his career as a primary school teacher. Little did he know that his actions were about to change the life of his students in the most remarkable way. Binti Primary School is in a secluded area in Al Hoceima. The road to school is a difficult one where walking the distance is your best option. The classrooms have desks and chairs, but as far as resources went this was it. All the children have a twinkle in their eye and a desire to learn more about the world. However, most of them have never ventured further than the perimeter of their little village. So for Hicham, as a teacher in the Binti Primary School, being resourceful and innovative was not an option. It was a necessity. Hicham was not discouraged by his school’s lack of resources. He decided he wasn’t going to simply make the best he can, with what he has. But rather, he was determined to do something extraordinary. He began by teaching his students the power of positivity and kindness. Together with the local community he transformed the classrooms to be more colorful, inspiring and fun. He organized visits for his students to explore the region around them, and integrated exciting activities into everyday learning. Moreover, Hicham turned to social media to create awareness about investing in education across Morocco and its impact on children’s lives. It wasn’t long before he stole the hearts of Morrocans across the country, as an “exemplary” teacher who loves his job. This young teacher continued to transform his students’ learning experience by helping them to discover the joy of learning. He also got them essential classroom resources as well as clothes. 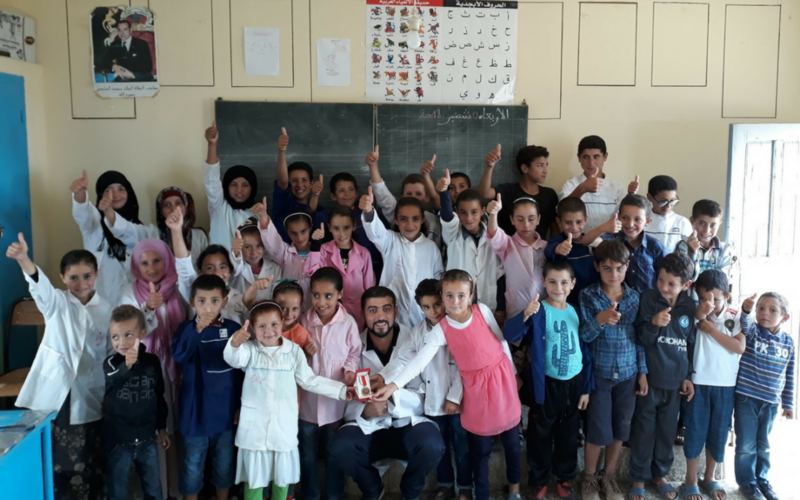 His efforts soon paid off when students of Binti Primary School achieved results which ranked among the best in Morocco. Moreover, his work caught the eye of the Ministry of Education in Morocco, and was officially met by Minister of Education Mr. Saeed Amzazi. On the 17 September 2018, his majesty King Mohammed VI decorated Hicham with a ‘Wissam of Merit’ medal. This ‘Super Prof’ changed the lives of his students by helping them to discover the joy of learning. Moreover, he shed a spotlight on challenges education faces in rural parts of the world. Why is Hicham’s story important to us? 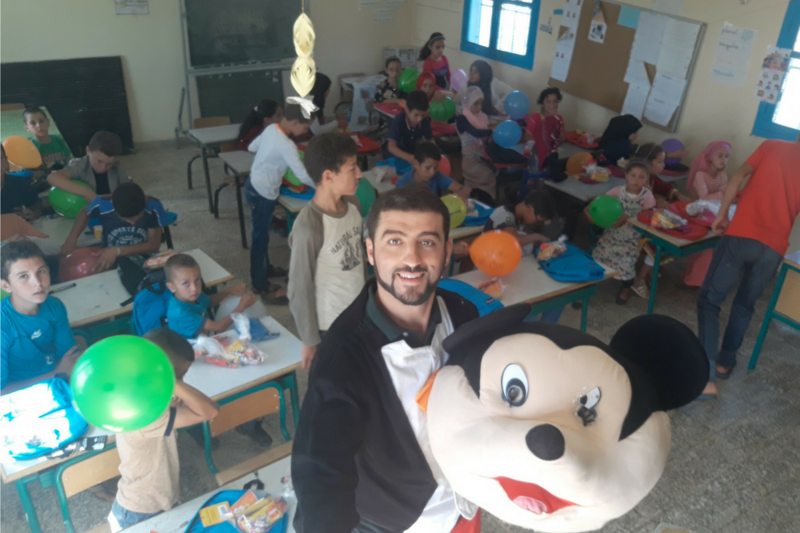 Hicham is an inspiration for educators across the world, looking to make a resonating impact in students’ lives under challenging circumstances. When you love what you do, you begin to enjoy the hard work that goes into it. You continuously try to improve yourself and find creative solutions to achieve your goals. Change doesn’t always have to come from top and be large scale. Change can start from the bottom-up, be small and yet impactful. We have followed Hicham’s journey over the last few years and are blown away by what he has achieved together with his students. Having invited Hicham for a Fun Learning Educator training in Finland, we are excited to welcome Hicham to our Fun Learning global community. Together we hope to extend the best of Finnish education to Morocco, and transform the life of every teacher and child in the country. Find out more about our Fun Learning approach and the brilliant partners who are collaborating with us.